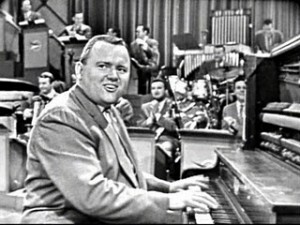 Big Tiny Little was a popular ragtime piano player on the Lawrence Welk Show from 1955 to 1959. One critic said he played like the piano was on fire and another wrote that he had the speed of Oscar Peterson, the left hand of Fats Waller, the rhythm of Errol Garner and the imagination of Andre Previn. Welk dubbed him Tiny Little, Jr. to distinguish him from his father. Later, facing his own rather portly reality, Little added the "Big" and dropped the "junior," creating the splendid moniker he carried for the remainder of his career. Big Tiny Little first began playing the piano at the age of six in Worthington, Minnesota. His father, also known as Tiny Little, was a well-known band leader throughout the Midwest. By 1945, Big Tiny Little had begun playing in a country band and then in a series of dance bands. He became fluent in a number of styles during this period and following years. Big Tiny Little left the Lawrence Welk Show in 1959 and was replaced by the troubled Honky-Tonk pianist Jo Ann Castle. After leaving the show, Tiny performed on virtually every music and variety show on the air including the first Mike Douglas Show, Ed Sullivan, Dean Martin and Dinah Shore. A part of that Dinah Shore Show featured four pianists at one time playing different interpretations of songs. Peter Nero playing jazz, Ray Charles playing rhythm and blues, Liberace playing classical style and Tiny playing Dixieland. Big Tiny Little passed away in 2010.